I'm currently using a corded optical Logitech Mx518 mouse at the moment but the scroll wheel is failng. I've tried cleaning it but no go. So I'm looking for a replacement. I would prefer a corded optical or laser mouse. I'm right handed and I don't play MMOs or RTS so I don't need something with a huge number of buttons so the Razer Naga is out. I tend to use a claw grip. Would like to keep the price under 100$ but will consider splurging. Anyone have any recommendations? This is what I bought when my Mx518 gave up the ghost. It is a great mouse. It is wireless, but it has a USB cable so you can play wired if you like. I do, myself. The rechargeable battery is pretty crap anyway. I swap mice for my MMO needs to a g600, but this mouse is good everywhere else. I use the 4 thumb buttons to weapon swap in Battlefield, and switch to accessories as well. You don't have to use them though. It took me no time to get accustomed to it after the mx518. I have a G400. It's essentially a clone of the MX518 with a different paint. *shrug* Not sure if they sell it anymore - probably replaced by a newer, slightly crappier model, knowing Logitech's recent trends with their mouse sensors. Edited by Bartimaeus, 22 September 2014 - 03:54 PM. Best mice I've ever used are the Logitech G5 and Microsoft Intellimouse Explorer 3.0. Still use both. Of course, they have since been discontinued but the Logitech G Series successors have been excellent, based on reviews. Most of the best mice sensors ever made are not produced any more, some of the newer ones are "okay". (4.) Support - If you use Windows 8, you can't overclock your USB ports to get better performance out of old mice, such as the Microsoft Intellimouse 3.0 or the Logitech MX500, so it might be better to use a native 500Hz / 1000Hz mouse. (5.) DPI - If you have a very large resolution (1440p+) and use a very high sensitivity (aka you move your mouse less than 10cm to do a 360 turn) then DPI could be considered somewhat important, but for the largest screen today 1600 dpi will be more than enough. I personally use 400Hz, as I think it has the best "feel" and I use a low sensitivity. Logitech MX500 (original, not the rebadge) - This mouse uses the arguably the best sensor ever made, perfect control up to a whopping 4.5 metres a second when overclocked to 500Hz+ meaning that you can use really low sensitivities with perfect accuracy. Downside: Prediction, Native 125Hz, needs to be overclocked. A4Tech X7 X-710BF - Good perfect control speed when overclocked, has a 3 x left click button Downsides: 125Hz native, Prediction?, impossible to find? Logitech MX518 (1600 dpi version) - The not quite as good MX500. Not made anymore, will probably never find one anywhere as they were replaced with an 1800 dpi version with a different version of the sensor late in the production line. A human can not move this mouse fast enough to even get close to it's unknown malfunction speed. Great mouse wheel Downsides: can only do stable 250Hz, 500Hz clips to 250Hz every now and again, 125Hz native, Prediction. I do not have any knowledge of new mice. There are so many of them now and my current mice (G400, Microsoft v3 on my spare PC and WMO 1.1a backup) will probably last me until I die. I would however like to collect a good condition MX500, 300 and A4Tech mouse if I could ever find another one. Edited by Sensuki, 23 September 2014 - 05:00 AM. You have to supply an email and sign up to get the driver and interface applet you use for keymapping and tweaking. I surmise the intent is to collect emails and user data for marketing purposes. Not even kidding. I like the keypad on the side, although it's not ergonomic enough, your thumb tends to slide off when hitting certain keys. Fortunately it works fine with a standard windows driver. It uses the USB recognition codes to emulate a keyboard specfically F1-F4 and The keypad. It's a 'gamer mouse'. You can tell by the pulsating LED backlit logo and buttons. Everything works. It's good but not great. Long story short I broke my Logitech and this was what they had at the store. Oh I like that. Good price, too. Plus it's two-hundred more of whatever scale my G500s is supposed to be. Which is great, by the way, on its own. The grippy grip area is comfortable, it's laser, you can add or remove weights, and it has little blue super-not bright LED adjustable-DPI indicators. Christ I just saw my mouse is a hundred bucks there at Newegg, I only paid $60 or $70 a year ago. Lasers are actually worse by default than optical mouse sensors, there's nothing special about them. I bought a Microsoft Optical and Logitech MX510 when they came out. Optical was ambidextrous so in practice only had 4 buttons, as the 5th was pretty hard to use. After the MX510 I've gotten the same shape mouse, g5v2, g500, was given a mx500 aswell. If the MX500 were still around I might just buy those when needed. One thing about laser mice is that they're less likely to have issues with hair or fluff than optical. DPI, sensitivity, arm positioning, practice, friction, acceleration, these are all way more important to gaming than the mouse. So my priorities are comfort, build quality, and a good scroll wheel. Had one of those for a number of years. Not 100% sure if it's the exact same model, but it Looks the same (was a Microsoft IntelliMouse according to the label on the backside) and had 5 Buttons. Best mouse I've ever had since starting to use a mouse on my Amiga 500 in the late 80's. 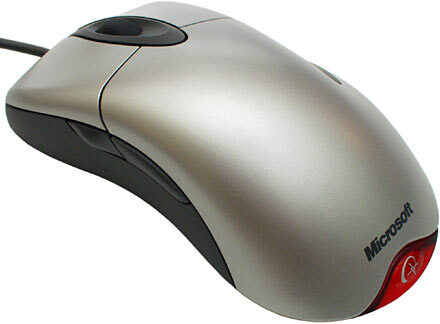 Edit: My current Steelseries Sensei is nice too, but I will always remember that old MS Mouse fondly. It must be a middle-ball trackball - I'm not a fan of thumb-ball trackballs and I will not, even under gunpoint, go back to a conventional mouse. It must have a scroll ring or scroll wheel. It must have 5 buttons. I freakin' loved that trackball. It was the most ergonomic mouse I've ever used. The button and scroll wheel layout was a masterpiece. Sadly, they stopped making them years ago. Even more sadly, the buttons on them were cheap as hell, hence why I don't have it any more (the buttons started breaking and eventually it was beyond repair. R.I.P. Microsoft Explorer Trackball ). These days, Microsoft Explorer Trackballs sell for around $400 because they don't make them any more and because people loved them so much. No way am I dishing out $400 for a (most likely used) trackball. It works well enough. The scroll ring on it is surprisingly good. Still, I really, really, really, really miss having a middle button (the scroll ring is obviously not clickable). Edited by Keyrock, 29 September 2014 - 07:27 AM. Those two small buttons, one to each side of the main ones, after getting used to them I cannot do without which is a pain in terms of finding a replacement. I use them for anything from switching primary & secondary in shooters, quckslot gadgets in Batman (very convenient), can get all Sleeping Dogs moves set to my mouse, etc. Wish more gaming mice were made with a larger number of conveniently placed buttons. If anyone knows of other mice with this set up let me know. Is that a pedal function. Does it have both axes using the palm of your hand or is it purely decorative ? Just sayin' that would be a cool way to scroll. I've a taste for turn based games and no taste for FPSs so I use a wireless trackball - a Logitech M570. To say I'm pleased with it would be an understatement, I'm considering buying a second simply so I don't have to use anyone else's mouse. Helps prevent RSI too. I'm so retro - I still use one of these. It fits my small hand. Occasionally I wish for a couple of thumb-side buttons I could hotkey for gaming, but such are too large/uncomfy for my palm and makes my wrist hurt after a while. Any tiny gaming mice (4-4.5" long) without weird contour shaping, out there? Logitech M905 "Anywhere Mouse" is the closest I can think of, still has scalloped sides, but not too funky shapewise. No personal experience, but I believe it's the successor to the well regarded VX Revolution I once used and was happy with.